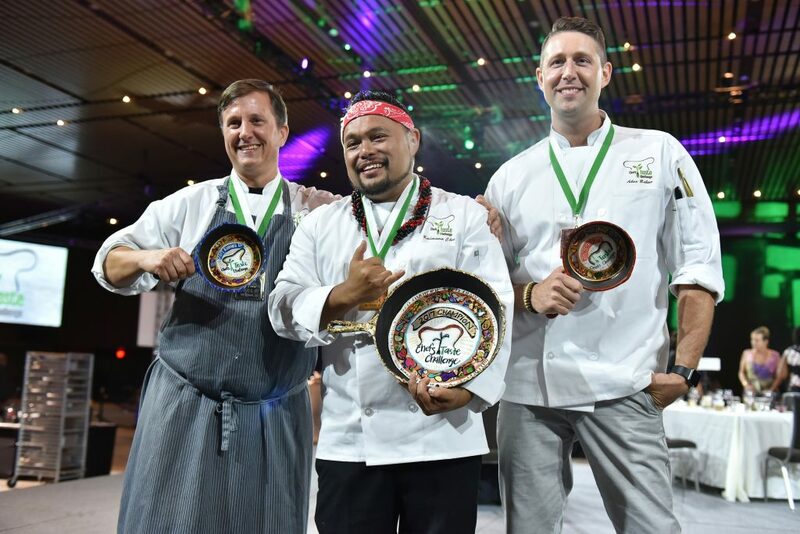 NEW ORLEANS – Chef Kaimana Chee of Hampton Creek & Uncle’s Hawaiian Grindz, Silver Spring, MD, was named Champion at the 3rd annual Farm & Table Chefs Taste Challenge (CTC), which took place September 8, 2017 at the New Orleans Ernest N. Morial Convention Center. His winning creation was “Kalua Pig Sundae” which featured Whole Pig with Breadfruit. Chef Alex Harrell of Angeline, New Orleans, LA, took home runner-up honors for his dish, Chicken Thigh Chorizo with Pink-Eyed Pea Agnolotti and Pink-Eyed Pea Chow Chow. Chef Alex Belew of Alex Belew Catering, Murfreesboro, TN, won the “Fan Favorite,” as decided on by the attendees, for hisr dish, Rice Grit Congee & Tomkha Broth with Quinoa Sesame Black Drum. The dishes were judged by a panel of industry-renowned judges including Izabela Wojcik, Director of House Programming, The James Beard Foundation; Billy Nungesser, Lt. Governor of Louisiana; Chef Hari Pulapaka, Chef/Owner of Cress Restaurant, DeLand, FL, and 2015 Chefs Taste Challenge Winner; Brandon Felder, Executive Chef, Centerplate; and Chef Plum, owner of Plum Luv Foods and a chef competitor in the 2016 Chefs Taste Challenge. Chefs Taste Challenge Sponsors generously donated additional products for the event: Organic Wine – Bonterra; Beer – Lazy Magnolia; Chef Plates and Favors – Earthborn Studios; Cutting Boards – John Boos Co.; Chef Jackets – RiteChoice. The Chefs Taste Challenge is produced by the New Orleans Ernest N. Morial Convention Center, in partnership with the National Farm to Table Alliance. The CTC is held in conjunction with Farm and Table NOLA, September 8-9, 2017 at the New Orleans Ernest N. Morial Convention Center. Farm and Table NOLA explores the cultivation, distribution and consumption of food and drink sourced locally to globally. For more information on Farm & Table NOLA, please visit farmandtablenola.com.